June 27, 2013 - The Federal Aviation Administration (FAA) and the Massachusetts Port Authority (Massport) unveiled two significant safety enhancements to Logan Airport’s longest runway. FAA Airport Improvement Project (AIP) grants totaling $50 million helped fund a crushable concrete safety barbarea at the harbor end of Runway 33L that is designed to prevent planes from overrunning the runway. The FAA also installed navigational aid improvements that will help planes land safely in bad weather. U.S. Transportation Secretary Ray LaHood said “Safety is our highest priority. These investments at Logan Airport will improve the safety of passengers and airline employees by providing an important backstop in case a plane overruns the runway." The new runway safety area includes a 300 foot wide concrete pier that extends 470 feet into Boston Harbor. The crushable concrete area is installed on top of the pier and covers an area 170 feet wide and 500 feet long. The Engineered Material Arresting System (EMAS) bed is designed to quickly and safely stop and aircraft as large as a 747 in the event the plane moves past the end of the runway. “These two safety projects are the latest example of the critical partnership between the FAA and Massport, which has one mission - enhancing the safety of the flying public and the air crews that depend on Logan airport,” said FAA Administrator Michael Huerta. The FAA approves the use of EMAS beds at airports where water, city streets or other factors limit the available size for a safety area at the end of a runway. The beds have safely stopped aircraft that overran a runway eight times since 1999. Massport began the $63 million project in 2011, using $50 million in FAA AIP funding and $13 million of its own funds. According to Massport, the project created about 70 construction jobs. As part of the runway work, the FAA worked closely with Massport to speed up the installation of an upgraded instrument landing system that provides precision guidance to help pilots land in strong crosswinds and winter operations when snow is on the ground. The new system also serves as a backup to another Category II/III approach. Massport funded the $15 million instrument landing system project, and FAA technicians installed it as part of an aggressive seven-month construction schedule. 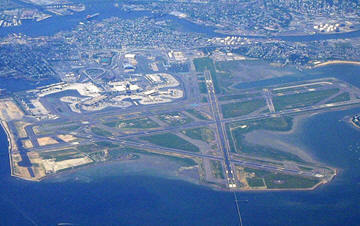 General Edward Lawrence Logan International Airport is located in the East Boston neighborhood of Boston, Massachusetts. It covers 2,384 acres, has six runways, and employs an estimated 16,000 people. It is the largest airport in New England and is the 19th busiest airport in the United States with about 13.5 million boardings a year and over 29.3 million passengers overall in 2012.